My spiritual room is my place of safety, comfort and betterment in my household. 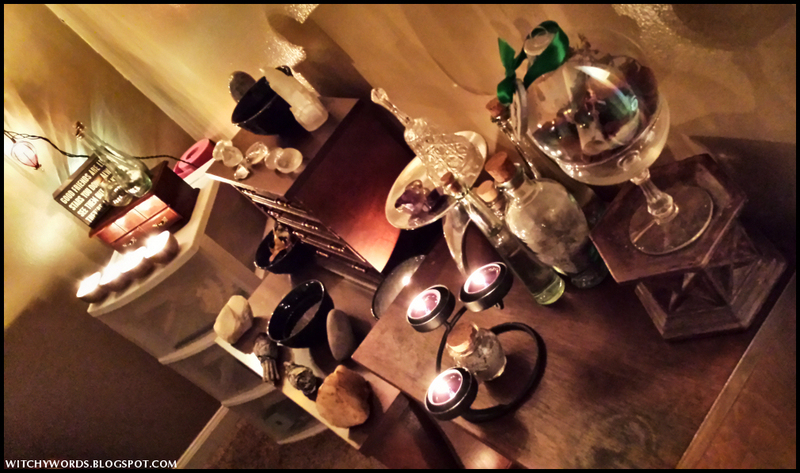 While it is used to host Circle of Northern Fountain sabbat meets, it is also my personal space. And I don't just use it for pagan activities; I also garden in it, exercise, paint and sometime even play games. It is my place to lose myself away from the formalities of life or to make myself a better person or to provide. It serves so many purposes, but all of them are expressly spiritual. 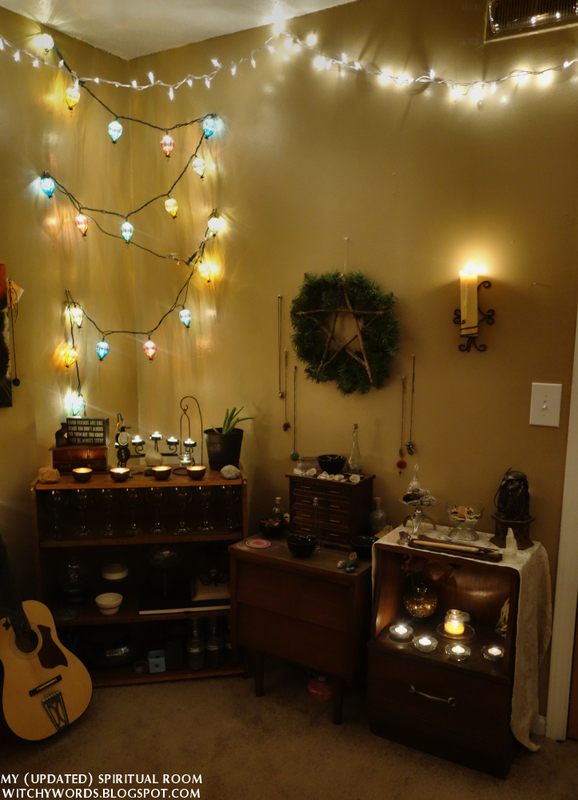 The last time I posted about my spiritual room was in August when we moved. Since then, it has changed drastically as I have personally. I've acquired new items, moved things around, changed circles, started a garden and now have a new familiar along with my other three. Since my spiritual room is an extension and representation of myself, it seems only natural that it will undergo metamorphosis when I do. Instead of dropping a huge photo-loaded entry and information on my readers, I'm going to split this into five parts: One part focusing on each corner and a final part tying it all together. If you have any questions as I go along, feel free to ask! Finally, before I begin, let me add a disclaimer that you absolutely, do not, under no circumstances need any physical object to be a pagan, practice your craft or otherwise participate in your spirituality. Repeat after me, folks: stuff is just stuff. Stuff doesn't follow your spirit into the next realm or the next life, whichever you may believe. 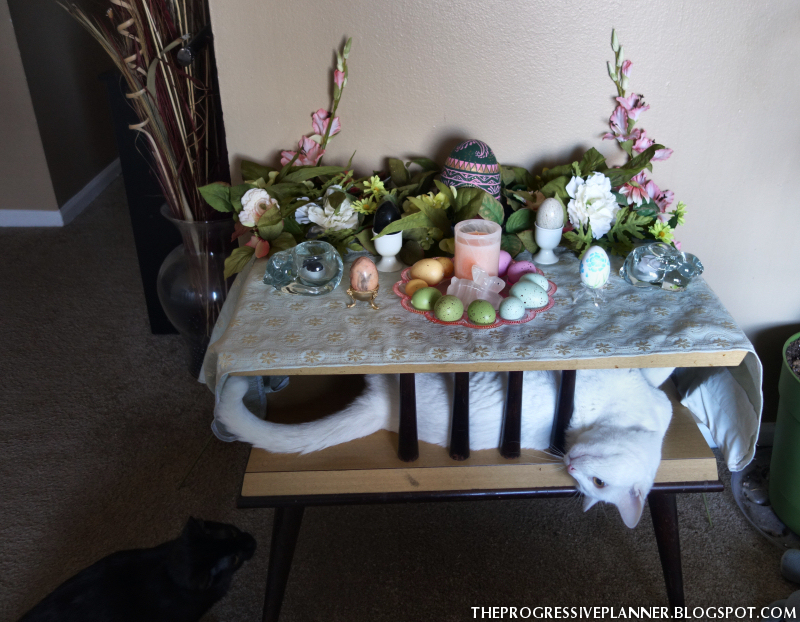 It doesn't somehow make you more of a person, or more of a pagan, to have more stuff. 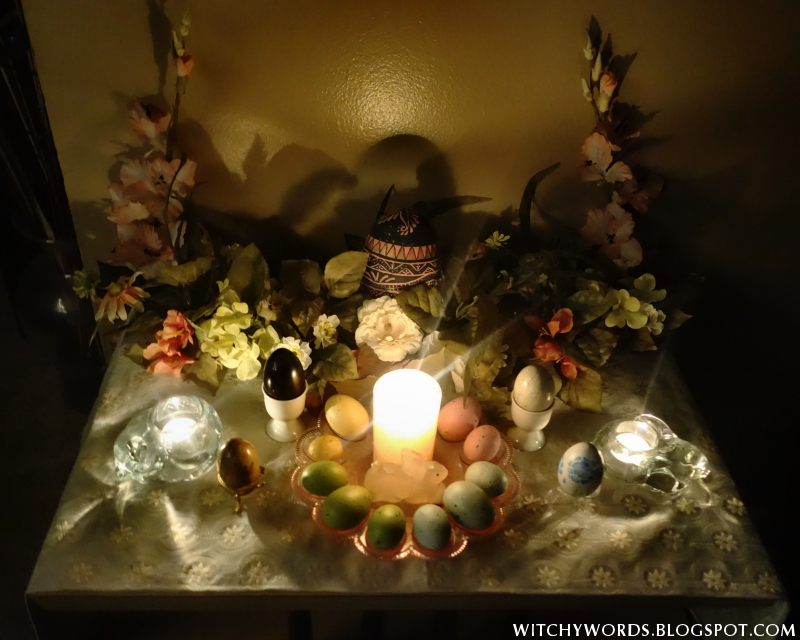 I am acutely aware that I have a lot of stuff, but I've been a pagan for (nearing) 13 years. I've had a lot of time to accumulate. Which brings me to my next point: You also don't need to spend exorbitant amounts of money for your stuff. 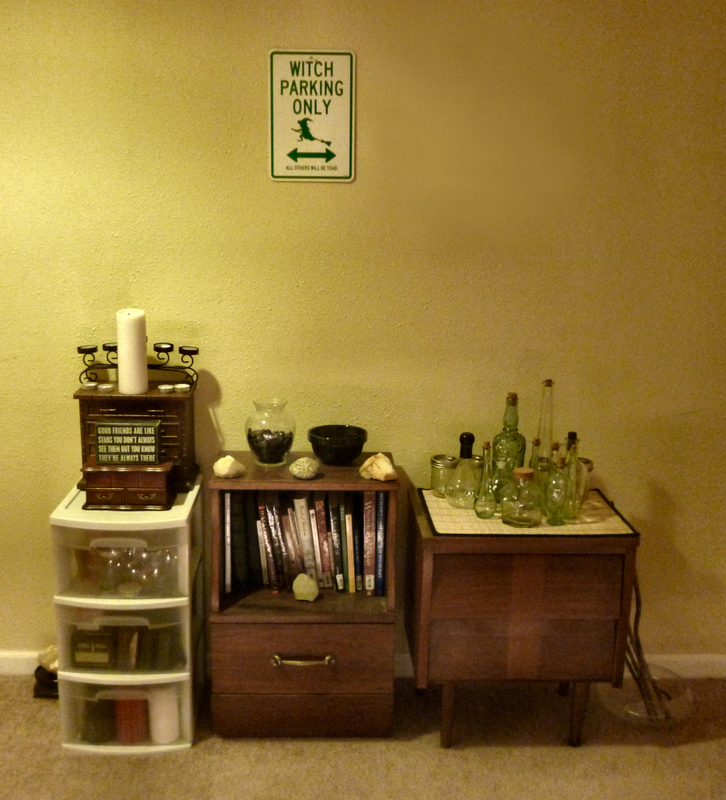 Because I've had so much time to accumulate my pagan and witchy belongings, I didn't spend much money on all that stuff. 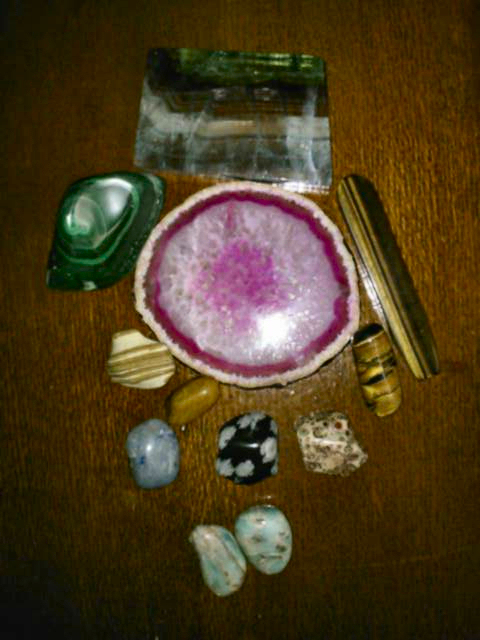 50% of it was found, 25% of it was bought at thrift stores, and the last 25% was bought from metaphysical stores and pagan sellers I wanted to support. I've picked up items from dumpsters or driveway corners. I have no problems getting dirty to get what's valuable to me when someone else saw it as trash. Have I dumpster dove a few times? You betchya. I frequent thrift stores like you would never imagine - often going once a week. I usually walk out with nothing, honestly and truly, leaving me with the satisfaction that I at least got a good walk in. But every now and then, I find a treasure. In fact, because of my amazing finds, my friends often label me the Thrift Store Queen. A non-pagan example: My mom had bought new cabinet handles for some of her cabinets, but they discontinued them before she purchased enough. I found the exact, literally exact, same handles in a bag for four bucks. There were over 20 of them! And this is just the most recent occurrence. I have the exact same luck with items for my spiritual room. 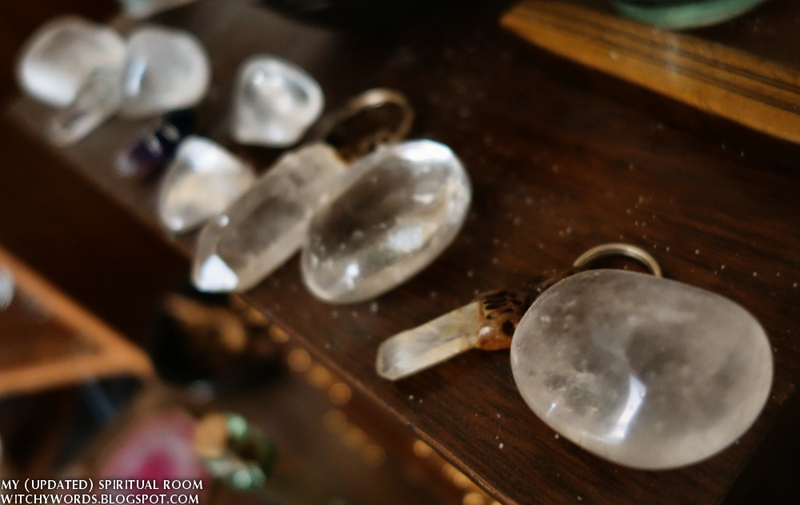 As for those items which I have invested in, I try to support my local metaphysical stores, such as Mystic Treasures, Aquarius and Crescent Springs, as well as local pagan sellers, particularly when the KC Renaissance Festival opens. I've even bought online, typically from sellers through Amazon.com, but I always, always check out who I'm buying from. I definitely want to know where my money is going. 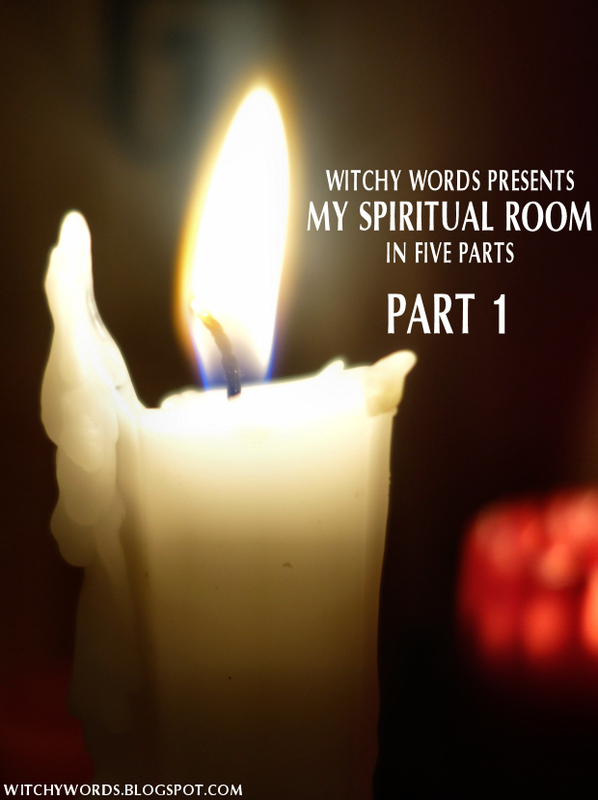 As I talk about my spiritual room in these five parts, I will note items that I've found, thrifted, gifted, borrowed and bought. And let's take a look at it now! 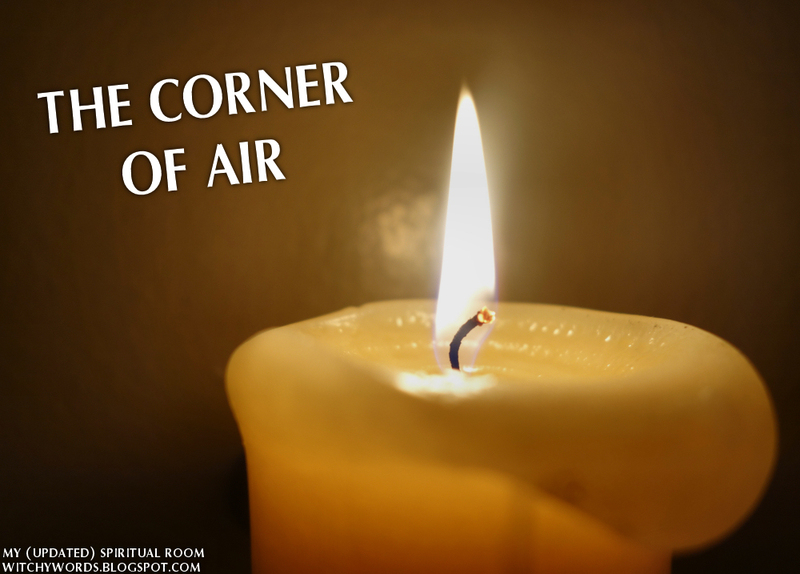 Of the four corners in my spiritual room, this one has changed the least. If you think that's a drastic difference, just wait! 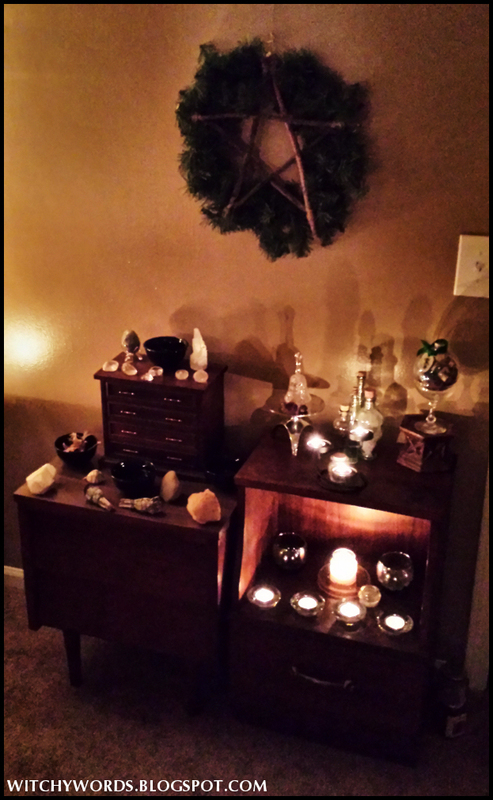 The altar to the far right is my original altar from almost 13 years ago. I found it discarded on a driveway corner and it called to me. 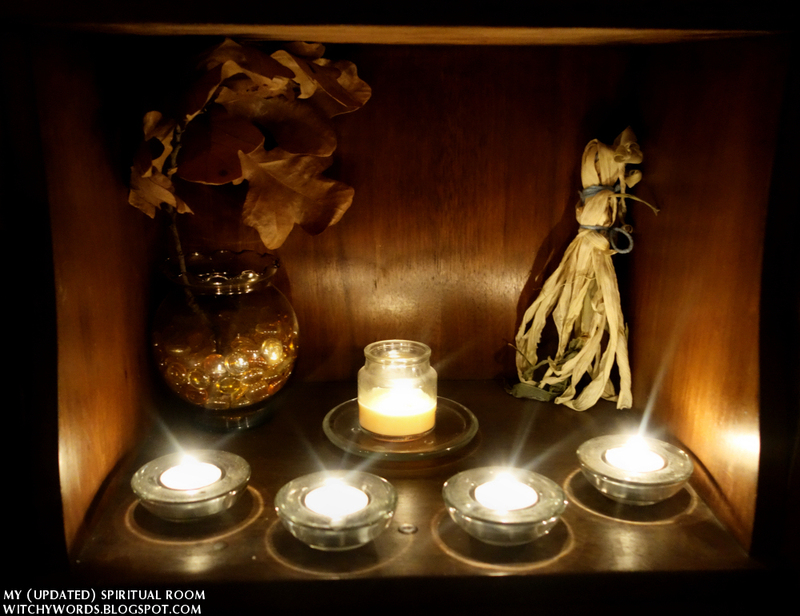 It masqueraded as my night stand during the day, as my parents were unfortunately unaware of my religious choice at the time, but at night, it was my center-most altar. 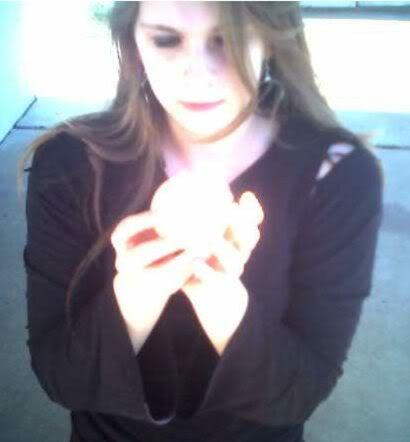 Here I am at 15 being all "delightfully witchy..."
... And here's my bedroom with my altar in nightstand disguise. Phew that was forever ago! You can see all the old artwork on my wall, hints of caricatures on the upper right from my new job as a caricaturist, and my altar. 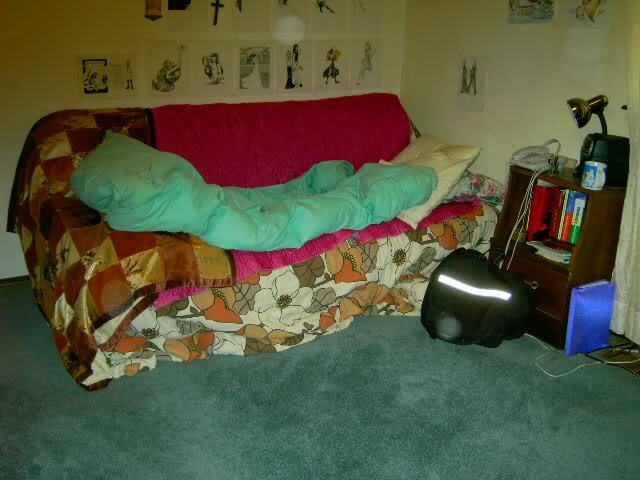 By the way, that fluffy teal thing on my futon is the most comfortable feather blanket ever. I miss that thing. But I digress. 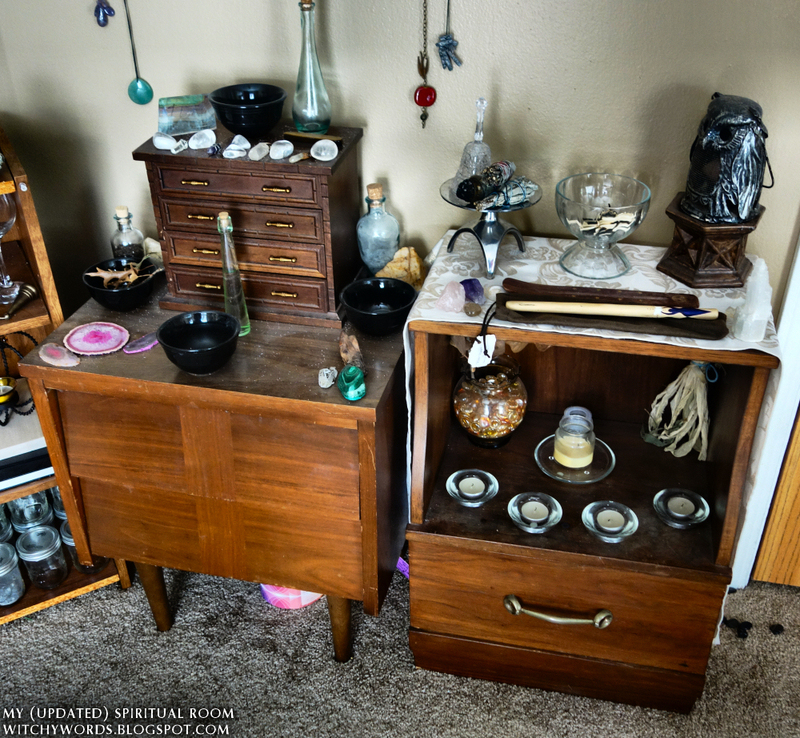 Needless to say, I've had my original altar a long time. The other stand we found while my husband and I lived in a rental house for a few years. The previous tenants had left it as they didn't want it, so we cleaned it up and added it to my collection. You can see that stand here in our rental house on the far right. That was my original spiritual room. It's come so far in the past few years! This shelf I dumpster dove for at our current complex. Someone threw it out, presumably because they put the top of the shelf on backwards. I don't care; a shelf's a shelf. It's also obviously a Walmart shelf, but it saved me $20 or so. I'll take it. Note the little wood statue and friends are like stars sign on this shelf. The little statue was hand carved by a relative of a fellow CNF guest member and good friend, Tony. The sign was gifted to me by my close friend Sara. I also have my particularly special string lights in this corner. I have how boho they look! When my husband and I first moved into the apartment, I reserved some money to spend on our decor. This came from Target for about $12 I want to say? It might have been a little more; my memory is shaky. That being said, while it was one of the few decorations I invested money in, I regret nothing. 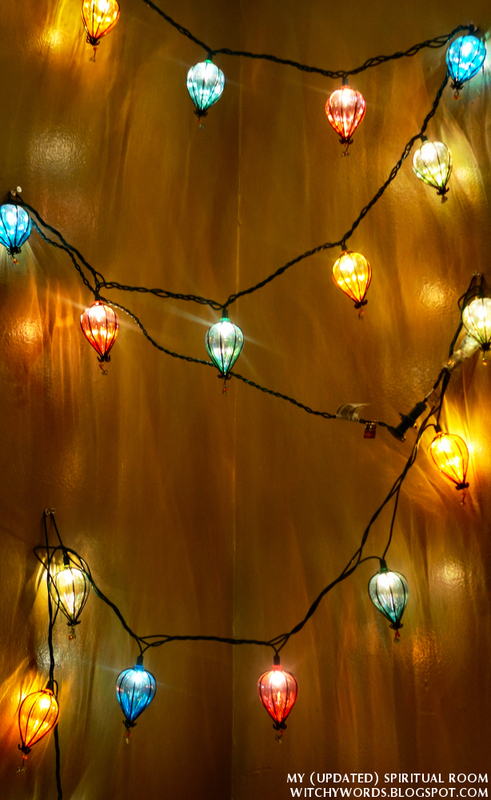 How many times can you find lights that include the notable four necessary colors? So, other than being the corner for East and the element of air, what do I use this side for? Mostly, storage of ritual items. I try to store certain items in their appropriate corners. Because this is the corner of air, I have incense stored in the drawers. 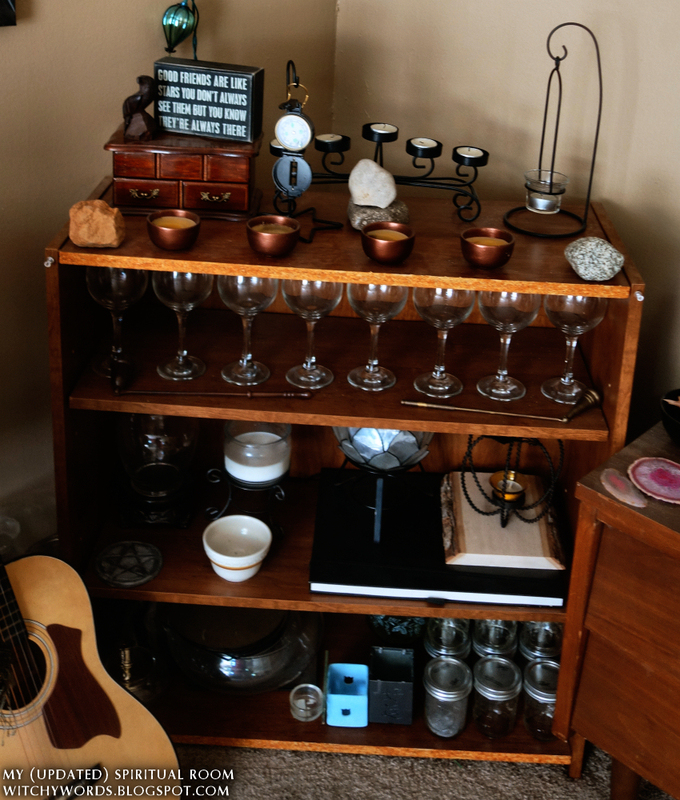 However, other items have a way of working into corners that aren't quite as appropriate - sometimes because they look visually appealing there, such as my stone collection, or because I don't have the room to store them elsewhere, such as my ritual wine glass set. All this stashed in a cigar box apparently no one opened or was interested in for $1! ... or a thrift store. That price tag reads $1.99. The blue stone is dyed quartz, but the rest seem fairly natural and appropriate! 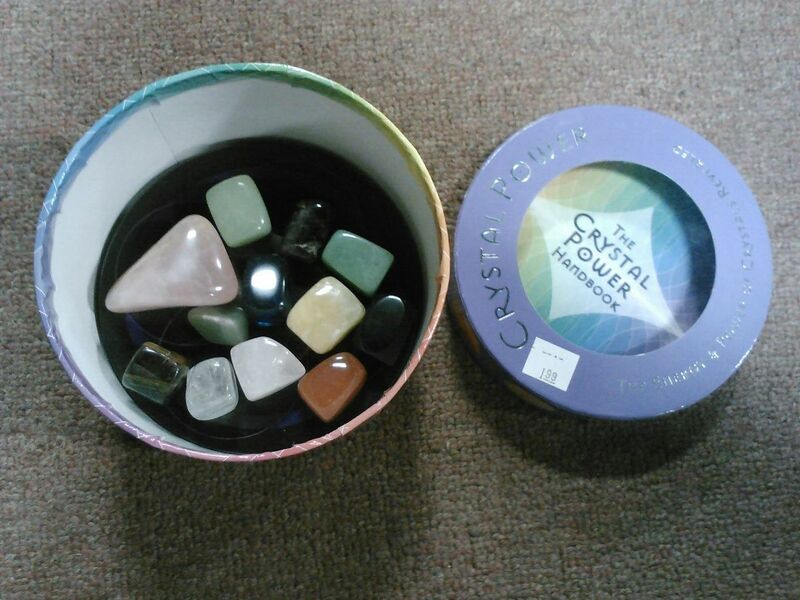 In fact, I've found literally all of my stone eggs from thrift stores. So there's something to be said about being patient, diligent and thrifty. Always purify your stones no matter where you find them! Use sage, salt, water, the full moon - whatever calls to you - but you certainly want to remove whatever happened in their "previous life." 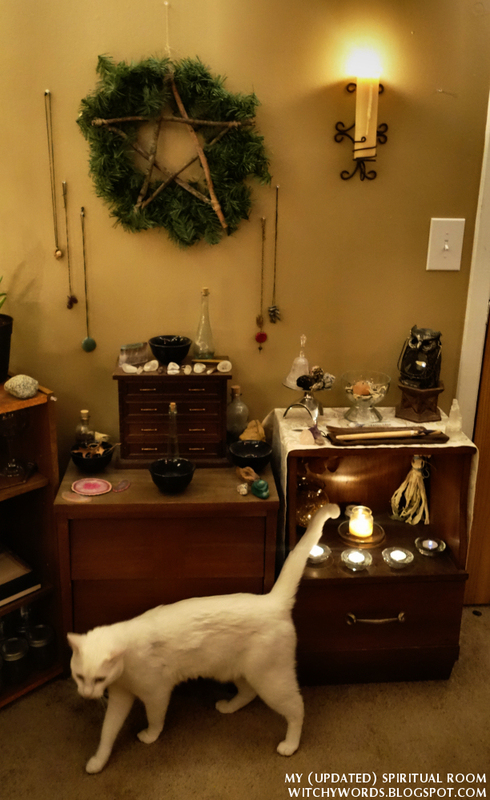 In addition to stones and incense, I store a lot of candle holders, my large BOS (which is still in-progress), and all of my pagan-related jewelry in this corner. Also, I would like to very quickly note that I had to install a magnetic plastic vent cover over my wall vent near the ceiling. 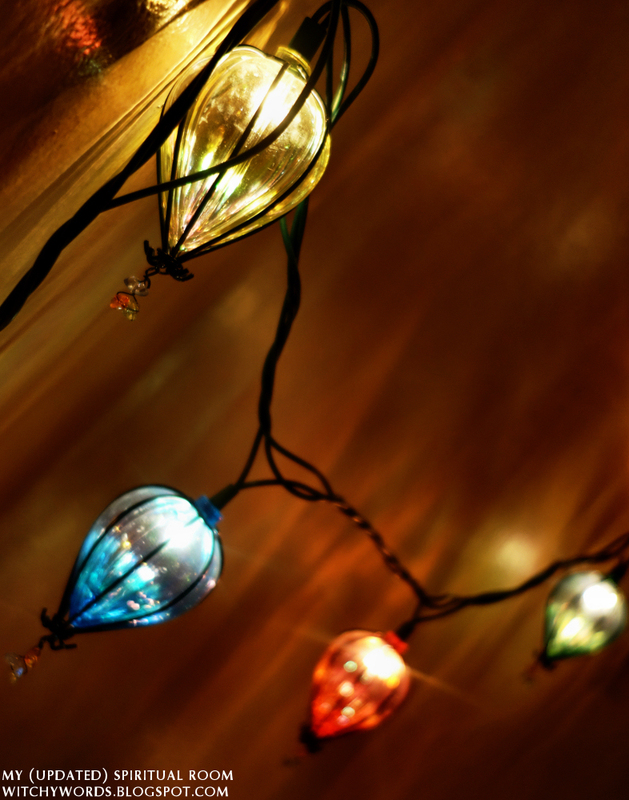 I use tall candles and tapers hanging from the wall to signify each corner. However, I found that the flames danced around, throwing wax everywhere and even going out if I left the vent running on its own. It was a physical and spiritual danger, so I used the vent cover to point the air towards the ceiling instead. A reminder that safety always comes before spirituality. You can't be connected if your house is burning down! You can see that vent cover in this picture on the upper right. As with each of my next three posts, I'd like to end with a small bit on the familiar I associate with each corner. 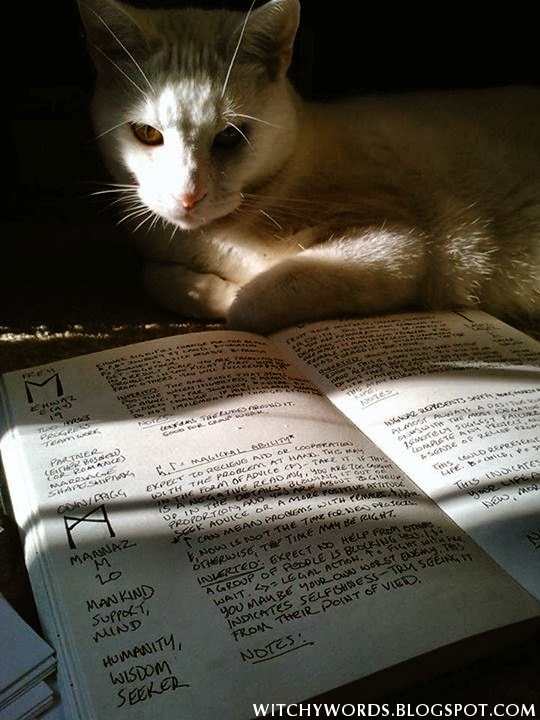 For me, my cat and familiar Hermes represents the element air. 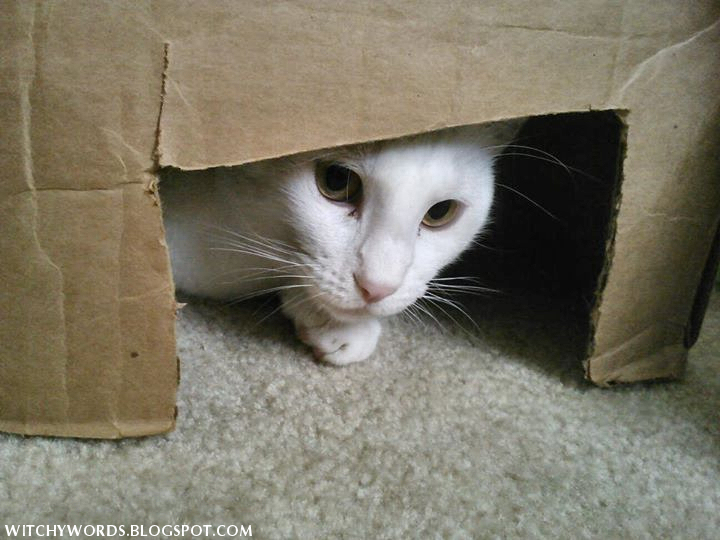 We found Hermes a few years ago in the mail room of our apartment complex with his sister. 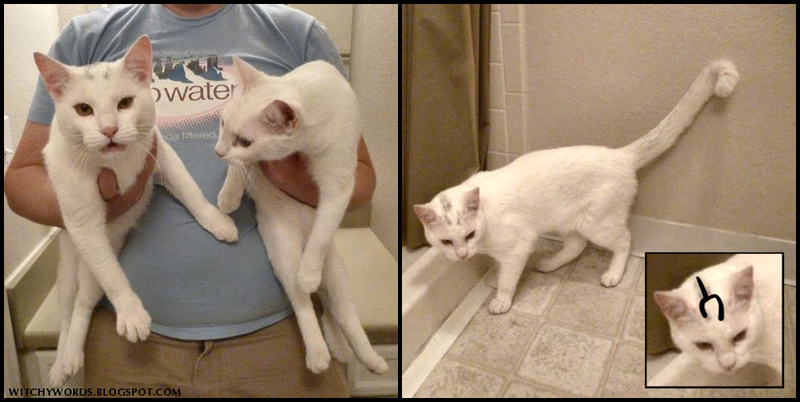 While she was adopted off (and named Khione, Greek for snow), we adopted him. Of all of our pets, he was probably the least traumatized by his experiences. We estimate that he was maybe in the mail room for 24 hours at most. Because of where we found him, and a distinguishable "h" mark on his forehead that faded after a year, we named him Hermes. ... or sleep underneath my front room altar. He's also an incredibly long cat, maxing out at over 4 feet long when stretched out. When I'm standing, he can touch my chest from the floor. It's impressive. So I'll leave you today with a picture of Hermes in his corner. Enjoy! Thank you so very much! I greatly appreciate it.